The 1st Regiment of Fusiliers-Grenadiers is made on the 21st of August. The regiment strives to become a disciplined, mature and skilled regiment whilst having an enjoyable environment for every kind of player. then 1er is a perfect regiment for you. Whether you are a grizzled veteran of NW/NaW or a beginner you are most welcome to join us. So if you are interested in joining the 1er and want to be part of a serious active but friendly group of people, don't hesitate to contact Darkwave on Steam! The 1er will mainly focus on participating in weekly-based linebattles and sieges. The Regiment will mainly focus on improving their shooting and melee to compete in future 1v1s and 2v2s against other regiments, training will also be set throughout the week to get our members to their peak performance in the game. On the other hand, we will be jumping onto public servers to have a laugh and to enjoy ourselves, other than that we will not only go as line infantry but also role-play as other units such as light infantry or artillery. We want to accomplish in Holdfast to become a fun mature regiment to keep the entertainment at its highest point. The individuals of the regiment are constantly cheerful when a new member joins in. We will willingly welcome all those who show interest by joining the regiment. 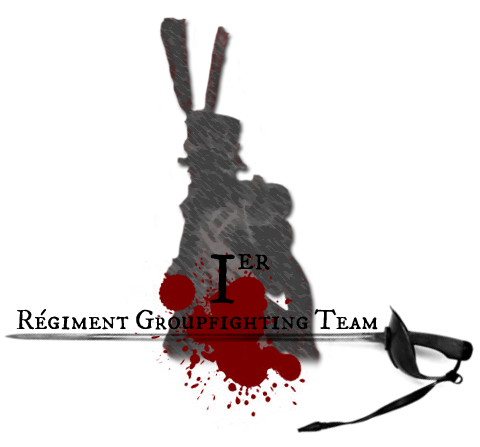 Once joined the regiment, Conscripts are expected to show great dedication and motivation towards the regiment as well as improving their melee and shooting in-game. If you are active and attend 2 bootcamps within the 2 weeks, it will award you a promotion to the rank of Soldat and from there, you will slowly but surely progress through the ranks. If you, however, encounter a problem within the regiment or your not to sure about something, then do please contact one of the Commanding Officers or a Non-Commissioned Officer as they will always be available at your disposal and would really want to help. If you scroll down a little bit more, you will find the recruit guidebook. Everything there will be explained what we expect from new conscripts. The campaign in 1812 in Russia destroyed the Guard. Napoleon rebuilt the Young Guard tripling its size. The epic events of 1813 saw the emergence of the Young Guard as Napoleon's effective shock troops, men who made up for what they may have lacked in the pomp and foppery of parade-ground ceremony with awe-inspiring, sledgehammer blows on the battlefield. At Dresden the Young Guard spearheaded the French onlsaught, smashing through the stubborn Allies line and assuring victory one of the largest engagements of Napoleonic Wars. The 1er Tirailleurs attacked 6 Prussian battalions and won 100 crosses of Legion of Honor. 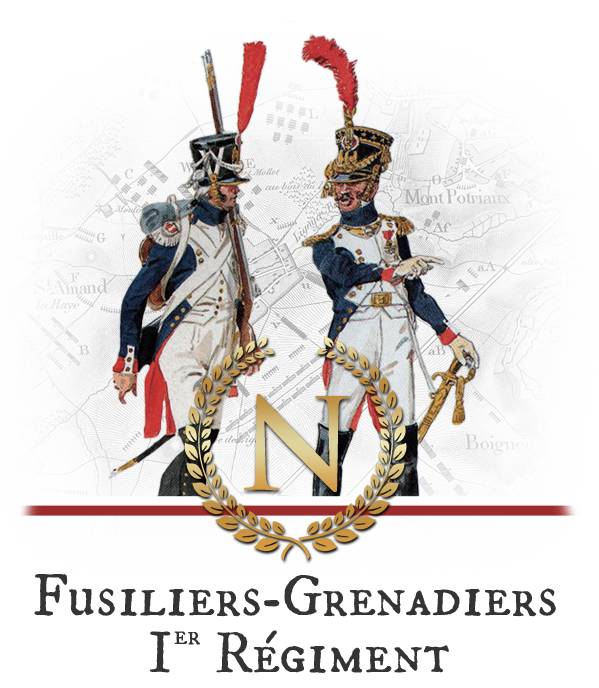 The Napoleonic triumphs in 1813 and 1814 found the Young Guard in the forefront of Emperor's juggernaut, surging on to the bullet-swept fields of Leipzig, and wreaking havoc on every enemy that tried to stand before them. At Lutzen they fought well. "More and more battalions arrived in our front line, and the Emperor ordered them to direct all their fire at the village. ... the Emperor drew his sword, placed himself between the two columns of Young Guard, and advanced through the resulting gap toward Kaja. The Young Guard stormed the vilage without firing a shot and ejected all the enemy with the bayonet." The Fusiliers (Fusiliers de la Garde) were formed in 1806 from selected conscripts taken from infantry and from departamental reserve companies. In 1806 the height requirement was 168 cm (soon it was heightened to 173 cm). Napoleon writes: "Young men who volunteer, may enlist in the two fusilier regiments if they are strong and healthy and measure not less than 5'8" (173 cm)." These young and strong men looked really good, however during one of their parades in Paris the public made fun of their sleeves which were "too short and coats which were too tight. Could they have grown ? Boyer, their colonel, was convinced of it." The NCOs of the Fusiliers came from the battalions of Velites, while officers from the foot grenadiers and foot chasseurs. In 1807 the 2nd Fusiliers had been formed from conscripts. Soon it was renamed to Fusiliers-Grenadiers. 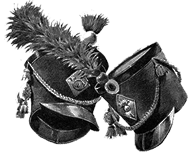 Until 1811 both units of Fusiliers were ranked as Young Guard. In that year they became Middle Guard. It was ordered that the Fusiliers were to be replenished with voltigeurs and tirailleurs of the Young Guard with 2 years' service and some education, and selected conscripts. Napoleon wrote that the most distinguished and intelligent Fusiliers with 4 years' service or citation for gallantry should be admitted to the Old Guard. Napoleon added: "Thus half or one third of the Fusiliers will be recruited from the Young Guard and conscripts and half or one third of the Old Guard from the Fusiliers." "The Gallant men of the Guard"
In 1807 in Heilsberg Napoleon's ADC Jean-Marie René Savary received order to take Roussel's 4 battalions of Fusiliers and 12 guns and support Murat's cavalry. commander of the Russian cuirassiers, GM Kozhin, was killed. One of the cuirassiers picked up his body, threw over saddle and rode away to the Russian lines. the fusilier-chasseurs of the Young Guard, was seriously wounded as a combatant at the head of this regiment with his accustomed courage." bother about the number of enemies' the Emperor ordered. The Guard batteries supported the attack, firing at top speed. Captain Bizard had his arm shot off. effectives. Lieutenant-Colonels Lanabere and Lonchamp as well as Rousseau, Secretan, Labusquette, and Ciceron were all wounded more or less severely." The Regiment will consist of Line Infantry for the time being. In Regimental linebattles, however, we will work with formations and try to re-enact historical line formations. These formations require high discipline and knowledge of the game and the commands. One example of this is a double firing column with line infantry and officers standing behind them. If we come to use various other units we'll be using light infantry as a flanking force with devastating firepower. We will try to bring historical 1800s fighting as realistic as possible to the battlefield in Holdfast: Nations at War. The Regiment will also use a wide variety of historical French military ranks. These ranks will be shown in-game, but they will be in the Teamspeak as well. Reaching higher ranks in the Enlisted section requires you to be skilful and very loyal. Roster will be updated every week. Here you can see which duties and tasks are attached to every rank. We want to show that EVERY member is important within the regiment and should be respected equally as the CO's and NCO's. Just because there is a rank displayed in front of your name doesn't mean you are just a puppet. Personal opinions are valued and will always be considered as feedback to improve our social group. Different duties and tasks are handed out so every member can have his contribution towards the regiment. Colonel: The colonel is the highest in command. He has the final say and will command the regiment. Max 1. Lieutenant Colonel: The Lt-Col is the second in command. He is one of the most trusted officers chosen by the colonel himself and leads the regiment when the Colonel cannot make it. Max 1. Capitaine: He is one of the more skillful CO's. He masters the bayonet and sword like a master. He also leads a small groupfighting team. A team that fights in groupfighting and duel events. Max 1. Lieutenant: The Lieutenant assists the Captain with his duties and tasks. He helps organising duel and groupfighting events. Max 1. Adjudant-Chef: He is the highest ranking NCO. He is very loyal and helps the regiment with administration and educating the other NCO's. Max 1. Élève Sous-Officier: He has shown loyalty and devotion towards the regiment for a long period. He is very effective in melee combat. Here they learn their first steps on becoming an officer. Max 3. Caporal-Fourrier: These men are the bravest and most skilled of the regiment. They can no doubt chaining up kills very fast. They are very loyal and take any order without hesitation. Max 3. Caporal: The basic Corporals are skilled with the bayonet, shooting and have been a longer time within the regiment. Max 4. Soldat Vétéran: These soldiers have been a tight longer in the regiment than the normal soldats. Expected to have a good skill curve. Soldat: These men are the backbone of the regiment and have finished their trial as conscript. They are expected to be loyal, disciplined and having a basic skill curve. Conscrit: Conscript is merely a trial rank. Interested volunteers who join the regiment have to go through a process. If a conscript attends two bootcamps (1 per week), he will be promoted to Soldat. Within the regiment we have musicians. They are here to make sure the men have enough motivation and morale. There are two musicians within the regiment, one drummer and one flute player. Next to the musicians we have Sappers. they makes special earthworks and defences to keep the regiment covered. Maximum 2 sappers depending on the size of the regiment. The Porte-Aigle (Eagle Carrier) is the one who defends the banner with the Eagle on top. His melee skills must be up to date to defend the banner at all costs. There can be only 1 Porte-Aigle within the regiment. We also use Medals. They are here to keep the men motivated to stay in the regiment and earn bonuspoints, so their hard work is not in vain. These can be melee medals, shooting medals and more. Flutist: He plays joyful and beautiful flute songs to keep the men motivated and giving a morale boost. Tambour: The drummer plays songs with the flute player but also plays drums to certain commands to alert the soldiers. Sapeur: These men are well trained melee combatants. They create earthworks and defences for the regiment. Porte-Aigle: The Eagle Carrier. His melee skills have got to be on point for defending the banner. Melee Medal 3: Awarded to players who have amazing scores and melee skill chains all the time at every linebattle. Melee medal 2: Players who can clutch out of multiple situations and are good at teamwork deserve this medal. Melee medal 1: Players who earned this melee medal have shown that they are fit for combat and have shown it throughout trainings and linebattles. Who and how old is the main leader of the 1er? the regiment or any personal matters, people can always contact me. What for atmosphere and environment has the 1er? help to make the regiment enjoyable for everyone whether you are a member or a non-member. Does the regiment enforce PTS? people are allowed to talk and tell some small jokes. How does this regiment work? For example realism? events. After the events and important 1v1's we also play some games together and work on our social relations with each other. Other games can also be played throughout the day. Just come to our Teamspeak and poke someone and I'm sure he'll love to play a game or two! Which companies does the regiment have? For now line. When more and more people will come in we will brand out to a light infantry company and a small artillery unit. What makes this regiment so special? you want to invite or even join the regiment! You host a Teamspeak server and an ingame server (soon). Am I expected to donate or pay? The only answer to this is No. Only I (Darkwave) am paying for this. No one has to help me pay for these kind of things. If you have any more concerns or questions you can always add me on Steam (click here). Thread optimized for 1920x1080 resolution. Rank icons are made by Garrel. Thanks to Xaime for the Medal icons.